Latest Scott Blvd. Baptist Church plan, presented on September 10, 2013. Click to enlarge or view full-size image here. For a larger view of the site calculation text on the right, go here. MANA Zoning Chair Theresa Same attended the September 10, 2013 Planning Commission meeting to continue tracking the redevelopment of the Scott Blvd. Baptist Church (SBBC) property. Fuqua Development presented a new site plan (that they had not shared with area neighbors prior to the meeting) and requested a deferral on their plan to redevelop the Scott Blvd. Baptist Church site. The Planning Commission recommended a full-cycle deferral. Full-cycle referral means that Fuqua's updated proposal will be reviewed again by the Community Council, the Planning Commission and finally the Board of Commissioners. During this period, Fuqua is supposed to discuss its plans with the community. 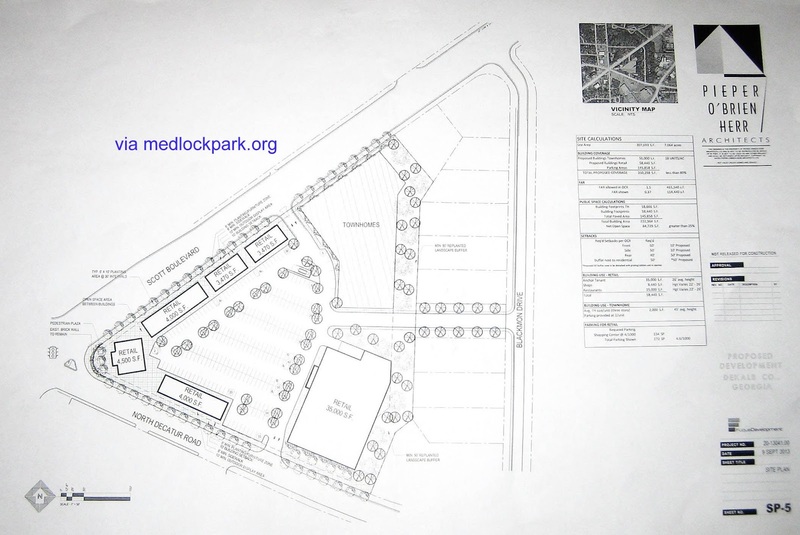 This latest plan reduces the number of residential units to 18 and building height to three stories (vs. 200+ units and five-story height in previous proposals) and introduces a new road connecting the SBBC site to Blackmon Drive. We are obviously concerned about the impact this road would have on the quality of life of Blackmon Drive residents. - left the houses on Barton Way intact (though Fuqua was still asking to include them in their land use plan change for future redevelopment). Plans 1, 2 3 as presented in various planning meeting. The newly proposed road connecting to Blackmon Drive, presented on Sept. 10, 2013, is highlighted in light yellow. Click image to enlarge. UPDATE: on September 24, 2013, the Board of Commissioners voted in favor of a full cycle deferral.